A guest review today – my father has put together his thoughts on The Chesser Cellar. I haven’t been there since a graduation lunch well over 10 years ago so I’d be interested to know what other Adelaide diners think. Judging by the 55% on UrbanSpoon perhaps my father’s experience is not atypical. Having dined at the Chesser Cellar in the past and found it to be an excellent venue, I decided that my interstate friends would find it charming if not a little quaint. The food had been of a high standard and the prices would be a pleasant surprise for those used to the excesses on the eastern side of the island. Whilst most of the above is still true, our food on this occasion was close to abysmal. The meatless goat curry was just the start of the problems and the half-hearted attempts to pacify one guest were less than satisfactory. Instead of taking the dish away and offering an alternative, a small dish of meat arrived a few minutes later. By this time the goatless curry was cold, and there was an obsequious “no charge for the meal sir”. One would hope not, as he went away hungry apart from an entrée of oysters. a week in advance and wait patiently in the refrigerator for Fridays. Who knows? A disappointing outing for all but one of us. Not on my list of places to visit anymore. What a shame. How can one forget to put goat in a goat curry? Strange. The photo looks nice, you think that something nice would be inside the restaurant. But do not judge a restaurant by it’s street view. Well, it sounds like the steak was good! As with all negative reviews this just makes me want to try the place for myself. They do also have a cafe & wine shop both of which I feel should be investigated! I have been living in Mel for sometime and “The Chesser Cellar” is always a must when I come back to Adelaide, I always bring my clients to this magnificent establishment, now my Clients are bringing their Clients!!! Say no more.. The Steak and Kidney Pie has always been a favourite and still is to this day, the pastry is Light and Fluffy, and oozing with sumptuous gravy and filled plentiful with “Steak & Kidney”.. One of my Clients had a fillet of beef, and mentioned it was one of the best Steaks he had ever eaten…The selection of wines are sensational, great choice and variety. 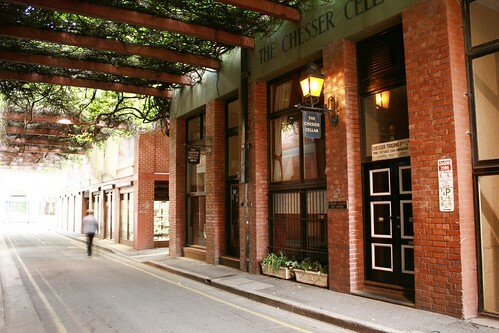 In Melbourne we are spoilt with a huge variety of Restaurants, but personally – The Chesser Cellar is always a must when in Adelaide. Despite the disappointing review above it’s still somewhere I want to check out myself. It sounds like at least one person in the party had a good meal so it can’t be all bad. Good to hear you enjoy it there!